And was seen to depart to the Lord of lords. 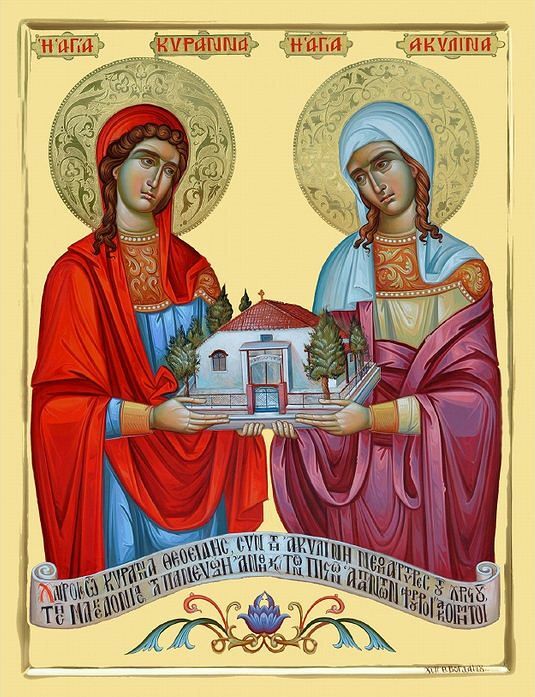 Our Orthodox Church today celebrates the memory of the New Martyr Kyranni or Kyranna. 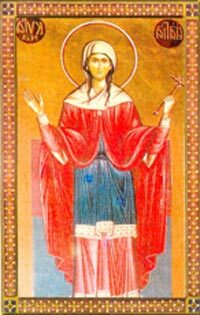 Saint Kyranna came from the village of Ossa near Thessaloniki, and was born to pious parents. Because she was very beautiful, one day a certain Janissary who came to Kyranna's village in order to collect taxes, upon seeing her, wanted to make her his wife. Even though he tried to persuade her to change her religion with flatteries and gifts in order for her to marry him, the modest girl stubbornly refused to resign to his flattering. Then he began to bully and to threaten her that if she did not give up her faith, he would torture and kill her. But the Saint did not change her mind, neither with the threats nor his bullying. He therefore captured her and brought her to the Turkish judge in Thessaloniki, where before the judge he lied by saying that Kyranna cheated him by promising him that she would become Muslim in order to marry him, but at the end she refused to do so. When the Saint was asked to defend herself, she confessed before all who were present her faith in Christ, and right after, the Turks imprisoned her. Inside the prison, the Saint went through daily torture from the Janissary and the prison guards. One would hit her with a stick, another with the flat of his sword, and another would kick or punch her. Then when they left, the jailer would come and hang her by her arms and beat her until he was tired out, despite the cries of outrage and rebukes of the common prisoners. Despite these torments, Kyranna would remain strong and courageous, and seemed unaffected by the pain as if someone else were suffering, and she refused the food offered her. One night, after seven days of such torment, on the 28th of February 1751, Kyranna was severely beaten by the jailer with a piece of wood and he left her hanging dead. This was done because the jailer had illegally allowed others in to beat Kyranna, and one Christian prisoner threatened to reveal this to the pasha. 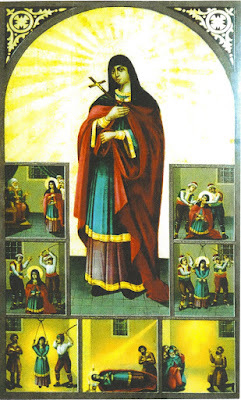 In the morning the body of the Saint was covered by Holy Light and gave off a celestial fragrance, as her soul was delivered to God, and the Christian prisoners upon seeing that, started to glorify the Lord, but the Muslims and Jews were afraid because they thought it was fire. 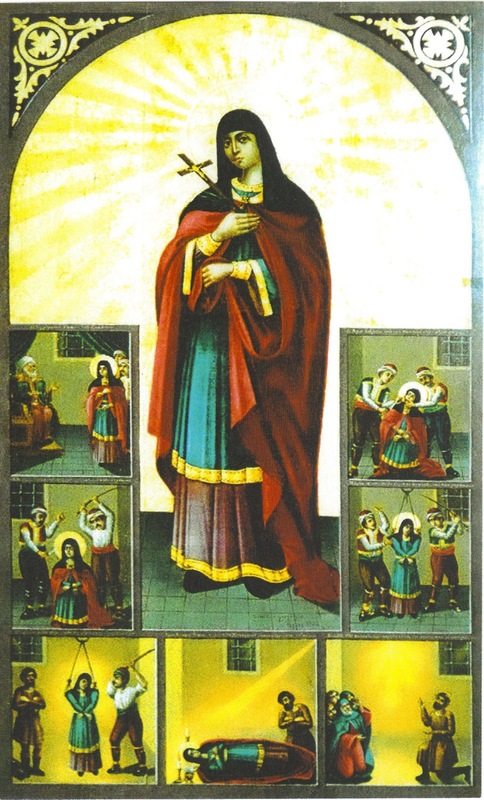 When a Christian prisoner went to bring down the body of the Saint and found out that she was dead, he took care of it, and the next day it was given to the Christians who buried it. This Christian reprimanded the jailer, who came to repent of his evil deed. Her body was buried outside of Thessaloniki, at the Cemetery of Saint Paraskevi. 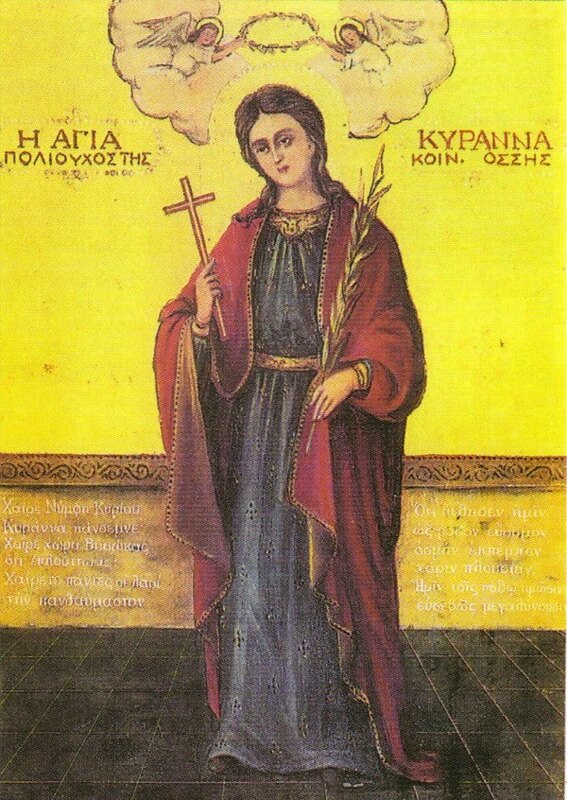 Today, in the village of Ossa, a great church exists dedicated to the New Martyr of Christ Saint Kyranna, who is also the patron saint of the community, and for this reason it is dedicated to her memory, since she was born and lived in Ossa. According to the historian Asterios Thilikos, the church was built in 1840, or according to its foundation date, it was built in 1868. 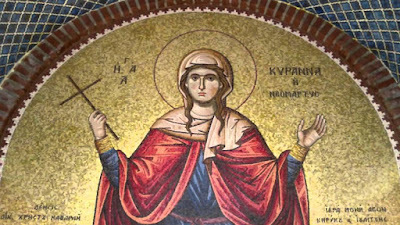 The miraculous icon of Saint Kyranna is kept inside the church, which was painted around 1870, by Christodoulos Ioannou Zografos from the village of Siatista. 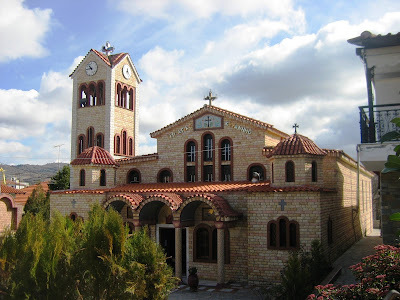 The church is a center of reverence for the villagers of Ossa, a place of worship throughout the region and her memory there is celebrated on January 8. In a Codex of Great Lavra her memory is listed for celebration on January 1. 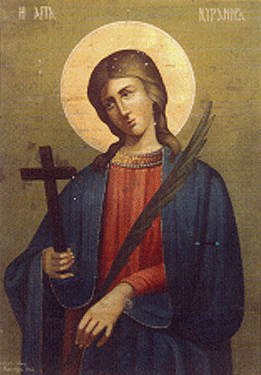 Generally her memory is celebrated on February 28th, the day of her martyrdom. 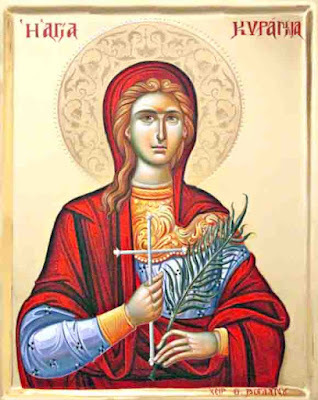 The reason why her feast is celebrated in January is because it often happens that February 28th lands during the somber season of Great Lent when celebrations are discouraged. 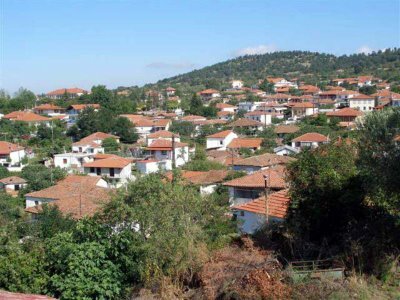 January 8th was likely chosen because the families of the village are together for the Christmas and Theophany holidays. Her memory toay is celebrated on the Sunday after January 8th. Rejoice offspring and divine offshoot of Ossa, Virgin Martyr Kyranna the Bride of Christ God, who firmly contested in these latter years, and destroyed the enemy, by steadfastly persevering. And now she ceaselessly entreats, on behalf of the faithful who honor, her blessed contest. Virgin Martyr Kyranna, true Bride of Christ and beautiful maiden, we hasten towards your fervent intercession, to release us from every disease and affliction, and give us unceasing joy. 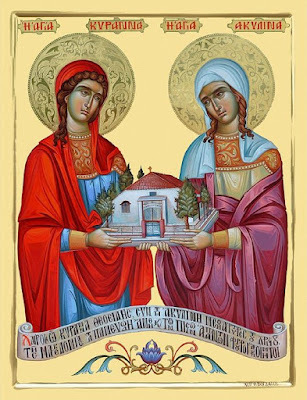 On every occasion we hasten to your intercession, revered Kyranna, receiving the requests, of Ossa that brought you forth, and we cry out to you with faith: keep away from us O Martyr, a life of misfortune and bitterness.